E-Documents allow the participants fill out a form while in the virtual waiting room, and electronically sign it. Users with an Account Administrator or Clinical Supervisor role can create/edit as many templates as needed, and delete templates as well. Common uses for these E-Documents include Statements of Understanding and intake forms. This support article illustrates how your participants can sign an E-Document. Required pre-session: this document is required to be filled out and signed before the participant can enter the waiting room. If the participant clicks "Enter Waiting Room" with at least 1 required document not submitted yet, the video app will not launch; the participant will instead be redirected to the signing page. Optional: The document is available to be viewed/signed by the participant, but is not required. Required post-session: the participant will be redirected to this document after launching the video app. Click on the "Submit" button to go that document. 2. In the document signing section, you'll see the name of the document you're currently on at the top of the page; this will also be indicated by "Complete Document Below" next to the name of the document you're currently on. You can use the "Switch To" button to move to a different document BUT if you have made any changes to the form, they will be LOST if you move on before submitting the document. The name of each document is listed in the column "Document Type", and the status of each document is listed in the column called "Status". 3. Within each document, please read the document contents and fill out any fields necessary. If a field has a red dot next to it, it is a required field. You will not be able to submit the document until those questions are answered. 4a. Once you have read/filled out the document, enter your name at the bottom of the page. 4b. If enabled by your host, you may see a box to create a line signature using your mouse cursor or finger. Clear Drawn Signature: Click this button to clear what you've drawn and re-do. Drawn Signature Not Working: If the signature field is not working with your device, you can dismiss the drawn image field and type your name into the regular signature box. Clicking "Reload" will refresh the page; you will lose any changes you have made to the current document. If you'd like to keep a copy of what you've submitted, you can use the "Download PDF" button at the bottom of the next page (the one that you'll see after clicking "Sign and Deliver Document"). 6. 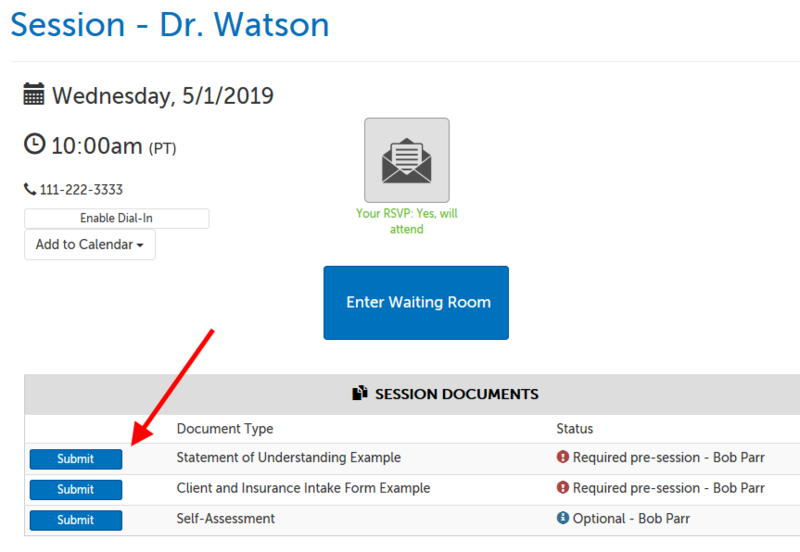 If you have multiple documents required pre-session, you will automatically be directed to the next required document when you submit one, until you no longer have required documents; then you will be redirected back to the waiting room page, where you can click "Enter Waiting Room" to join the video session.